Nurses Cottage Self-cateringAptly named by Beatrix Potter - the 'nurse' was employed by Beatrix to care for her mother as well as tend to the needs of the villagers around Hawkshead. The cottage is situated some five minutes walk from Hawkshead village centre - its tea rooms, local shops and pubs offer every amenity and convenience. Superb walks and bike trails abound in nearby Grizedale Forest, Esthwaite Water, Claife Heights and Tarn Hows. 'Go Ape' in Grizedale is a highly memorable adventure. Dating back to 1702 this is a truly authentic cottage of the period and whilst completely newly refurbished to the highest possible standard, it still retains the original features - oak panelling, beams and the original dated court cupboard. Accommodation: A great deal of thought has been given to the colours and co-ordinated fabrics which are complemented by the comfort and warmth and amenities. Entrance hall with original Westmorland panelling and court cupboard - to the left a dining room with antiques and subdued lighting for that special evening meal. To the right a comfortable sitting room (flat screen TV, electric fire, video and music centre, books, games and videos) - 19th century antiques and spice cupboard. The newly fitted modern breakfast kitchen has everything you will need and accesses the spacious cottage garden with patio - perfect for alfresco eating. Period walk-in larder and utiliy area for drying, and storage of outdoor gear. Upstairs there is a square landing accessing the two bedrooms - one double and one twin - and two bathrooms. Outside: Integral garage for up to two cars parked in tandem. Garden as described above. Shops and dining in Hawkshead village half a mile. Fuel tariff: April to end September £30 per week; October to end March £40 per week. Note: Sorry no children under 5 years. 2 person price applies only when one bedroom is used. May be able to access shared Wi-fi with Syke Cottage across courtyard but is intermittant. Aptly named by Beatrix Potter - the 'nurse' was employed by Beatrix to care for her mother as well as tend to the needs of the villagers around Hawkshead. 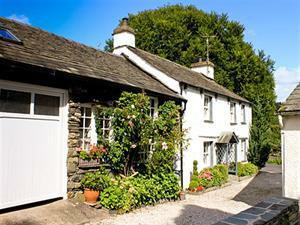 The cottage is situated some five minutes walk from Hawkshead village centre. Linen includes towels. Children welcome from age 5. Nurses Cottage offers weekly bookings starting on Saturday. Fuel Tariff, summer £20 winter £30. Free membership to Low Wood leisure club. No children under 5.